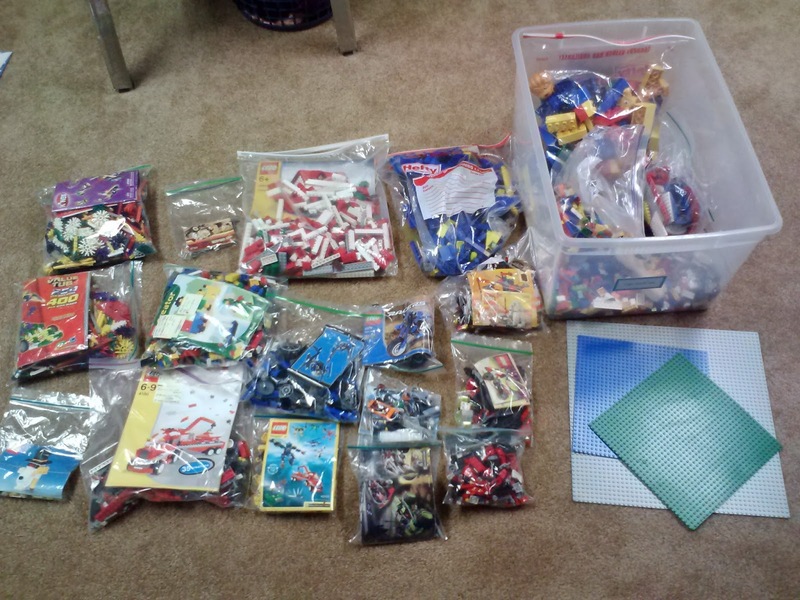 Back in June 2012, I wrote the post Taming the Toys, Part 1, admittedly, a very tedious project of sorting out our sizeable Lego collection, in an effort to make them accessible and useable to my youngest two children. I realized that I never posted the final outcome of that project, as I was in the middle of the process when I shared it on the blog. Pictured above is the result of all of my sorting. 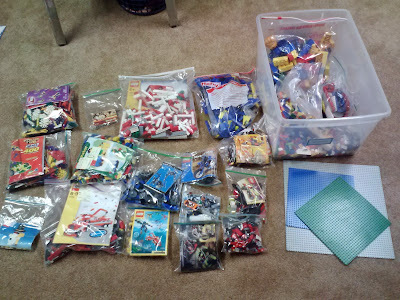 Three sets of K'nex, fifteen sets of Legos, plus a bin of leftover miscellaneous Legos that can be used for free building or extra parts. The sets are a variety of houses, fire equipment, motorcycles & vehicles, airplanes, etc. Very overwhelming when mixed together, but very useable when separated. 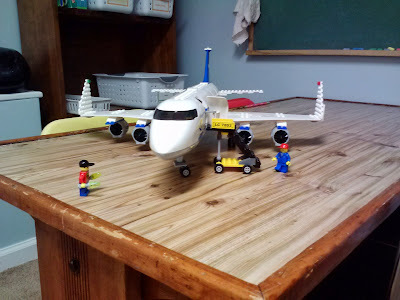 So... when my son came home on a break from college, he was able to go down to the basement and make this airplane with his little sister and all the parts were there. This is what I have out for the girls to use on a regular basis. A small complete collection, with instructions that they can take to the tabletop and complete, some with, some without assistance. Just right for their level now, and I can easily switch out a new set whenever they want. 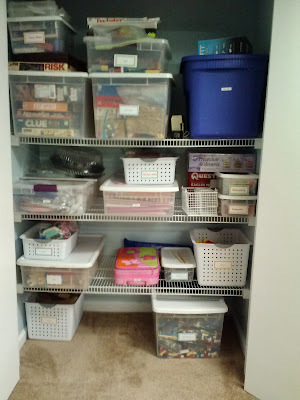 This is how I store the extra sets, in a clear bin on the bottom of the closet, with some other building supplies such as Duplo blocks, Magnetix, Thomas the Train and wooden blocks. 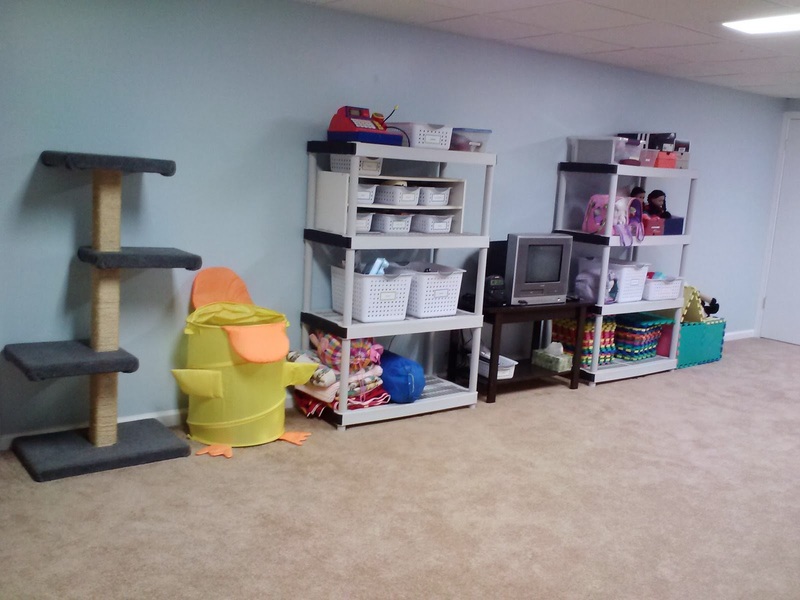 The top shelf is off limits as it is games for older kids and baby toys. The second shelf is also off limits as it is my party/entertaining supplies. So the last few weekends, I had been feeling frustrated with my girls for not keeping the basement clean. I talked with them about it and found out that it was hard for them and their friends to put things away after they used them. It became clear during the conversation that they were overwhelmed with the amount of toys in the basement. We do clean out on a regular basis, but I realized that they were right. They had changed significantly since the last purge about 2 years ago, and many of the toys had remained, while older aged toys had come out and there was too much. So we set to work. I asked them what they liked to play the most. This was easy for them to answer, as make believe/doll play was at the top of their list. I also wanted them to have a space to watch a regular and yoga videos. 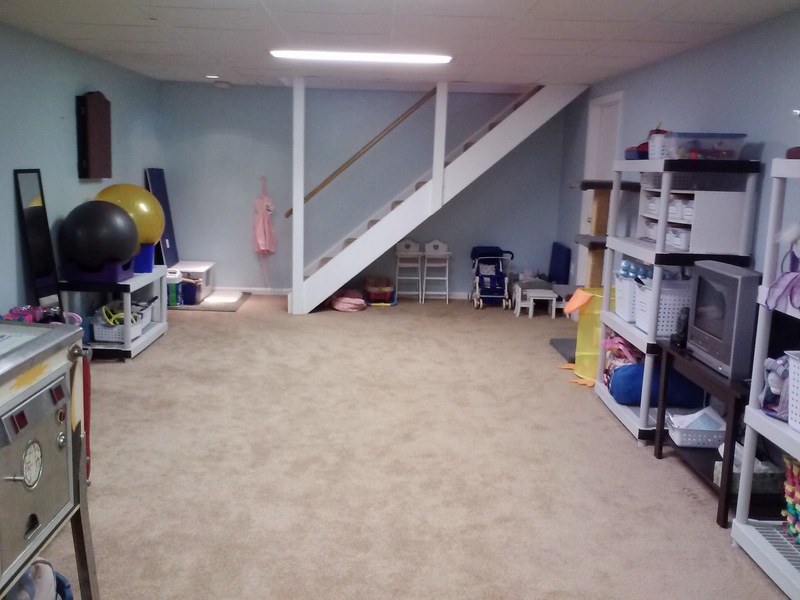 Another important factor was that I wanted to have a space where I could exercise alone or with the girls. When the girls were younger (and shorter) I had purchased two plastic 5 shelf units and split them into 4 sections of shorter shelves (2, 2, 3 and 3), as seen in this older photo, below. Shanna is blocking the TV, but it is sitting on a shelf, behind her. The first thing I did was to buy this TV table ($29 Sauder, on sale at Valu- no link available) and take my two existing shelving units (~$40 HDX @ Home Depot) and put them into a configuration of two 3 shelf units (and one two shelf unit- used in the exercise area), freeing up much needed floor space. We went through the toys and purged anything broken or missing, and anything they no longer played with. I decided if it was something I wanted to keep for my potential grandkids, and if not, we donated it. This step was not too difficult because of our regular purging. We were really down to mostly basics and keepers. Here is the result. Doll clothes and accessories are in the two large bins on the right shelf. Kitchen and food are in the large bins on the left shelf. They like to play shopping and store a lot, so they take various empty boxes and bottles from our kitchen to use in play. 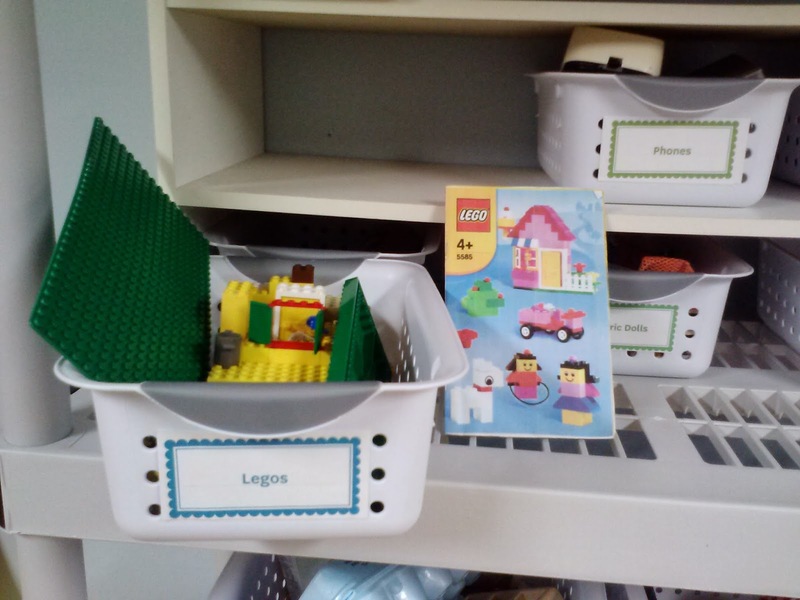 Small toys, such as the doctor kit, Legos, small blocks and play phones live in the small bins on the left shelf. Musical instruments and a small camping set are on the top left and on the top right are empty boxes that the girls constantly use for doll beds, couches, lockers etc. 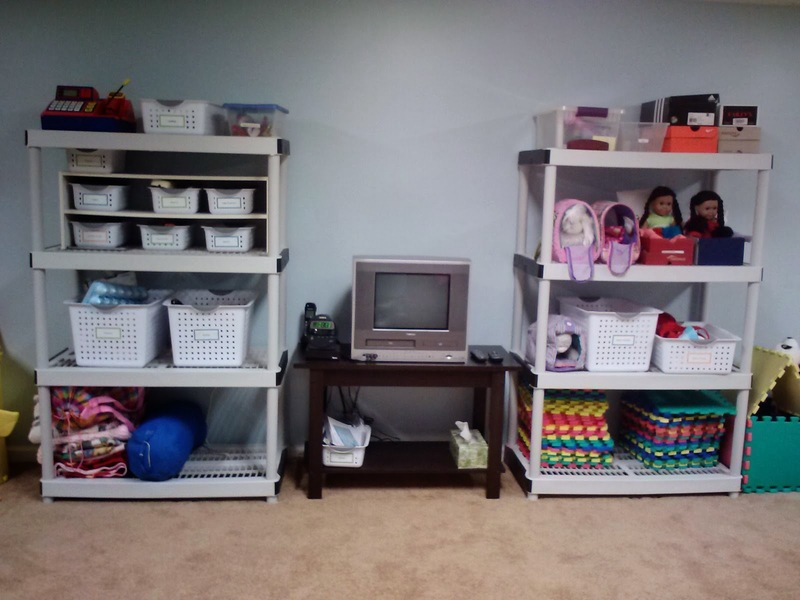 On the bottom left are doll/people blankets and sleeping bags and on the bottom right are foam floor pads that are constantly being built into houses and cribs for the dolls. The stuffed animals live in the yellow duck laundry hamper. Backpacks and small purses live in a round laundry basket underneath the pinball machine (shown in picture of full room, below). Almost everything can be used interchangeably and can be left out for a period of days, and then easily put back as everything is clearly labeled and fits into its container. Another essential piece was the creation of a school area. I had all the components scattered throughout the basement, and simply brought them all to a corner behind the pinball game. This created a little "room" which the girls are very excited about. 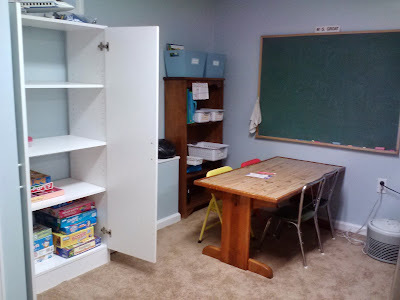 They insisted they wanted "a locker" so I swapped spaces with them and put my entertaining supplies in the bigger closet and gave them the cabinet for their games and school supplies. 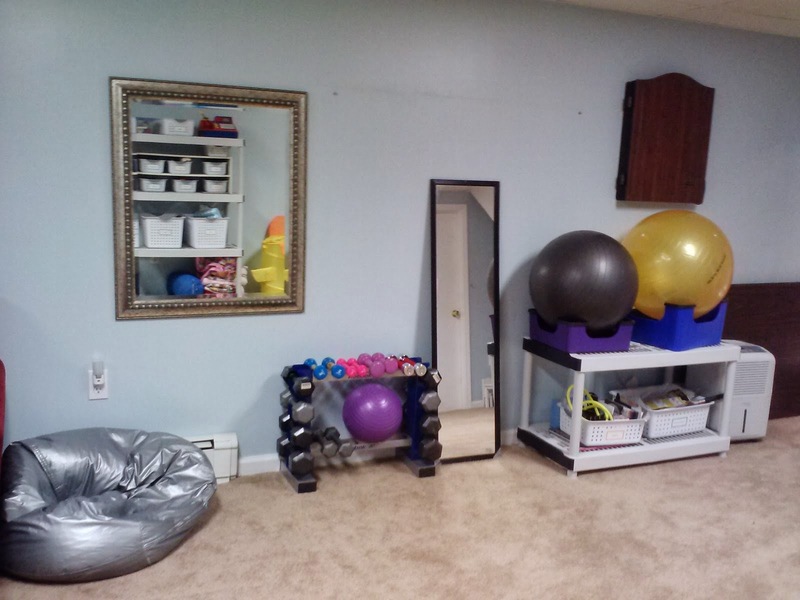 The final piece was the creation of the exercise area. This worked out really well. The balls were rolling all over the place, so I used some step stools that I had (upside down) to corral them. The square mirror was one I had stashed away in the attic and the full length will soon be hung on the wall. On the shelves (leftover from the reconfiguration of the 5 shelf units) in the bins are exercise clothing and gear, like resistance bands and workout routines. The weight rack was something I have had for a long time and is really useful. Here is a link to a similar rack on Amazon and another, slightly different. 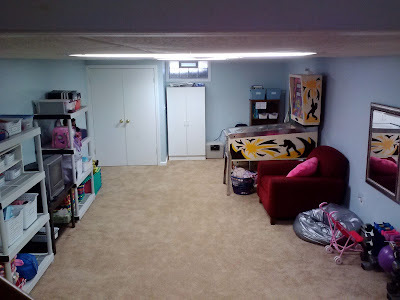 So here is the overall view of the basement. A manageable, inviting space where everything has it's place. The girls can take things out, combine things together and really enjoy their play. And the view from the other way.